From left: Lyron Co Ting Keh, Samuel Ferguson and Braden Milford. Sometimes a Scout’s mountaintop moment doesn’t happen on an actual mountain. Sometimes it happens in a science lab. Three Scouts, hailing from California, New Jersey and Oklahoma, have been named finalists in the nation’s oldest and most prestigious STEM competition for high school seniors. Lyron Co Ting Keh, Sam Ferguson and Braden Milford each completed projects deemed worthy of top 40 status in the Regeneron Science Talent Search. Lyron, Sam and Braden will receive at least $25,000 apiece. If they are selected in the top 10, announced March 12 in Washington, D.C., they could receive between $40,000 and $250,000. The Regeneron Science Talent Search, put on by the Society for Science & the Public, helps inspire and engage the next generation of scientific leaders. Alumni have won the Nobel Prize, founded major companies and invented groundbreaking medical treatments. What will Lyron, Sam and Braden go on to do? 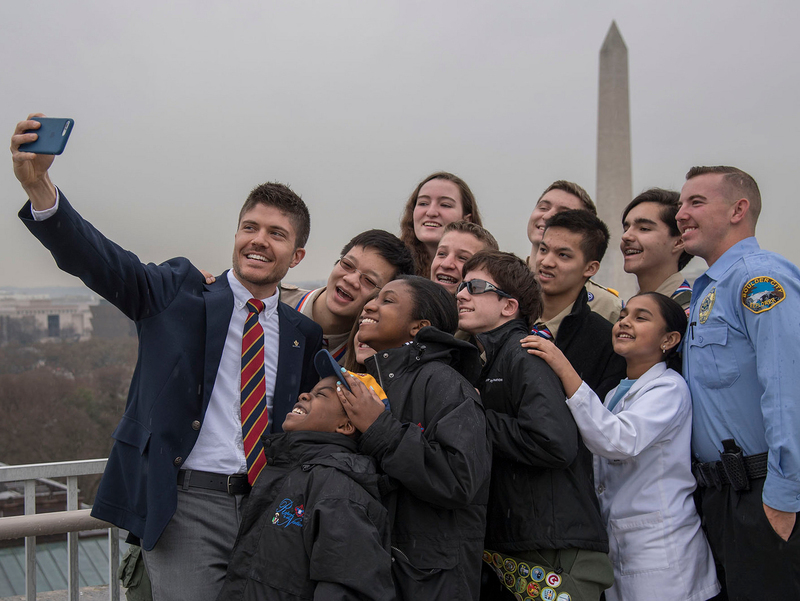 With their backgrounds in both Scouting and STEM, the possibilities are endless. School: A senior at Crescenta Valley High School in La Crescenta, Calif.
What he did: Lyron developed machine learning algorithms with the potential to detect and diagnose six common cancer subtypes at an early stage, using a single blood sample. His liquid biopsy could be more effective and less costly than existing tests. School: A senior at West Windsor-Plainsboro High School in South Princeton Junction, N.J.
What he did: Sam created a computer design for a blended-wing-body aircraft that he estimates would use 40 percent less fuel and require less material to build than an equivalent conventional airplane. School: A senior at Cascia Hall Preparatory School in Tulsa, Okla.
What he did: Braden developed an inexpensive method to combine algae and environmentally sourced bacteria into “beads” to biologically remove metals from contaminated water. To read more about the Regeneron Science Talent Search, check out the official site. That’s also where, after March 12, you’ll find out whether Lyron, Sam and Braden were selected in the top 10.